ABC Series Fuses - Gekko, Inc.
With a range of sizes, forms, and power, the ABC series fuses are designed to manage powerful electrical currents and provide protection. 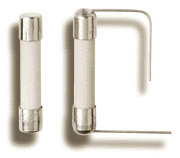 Produced by the leading manufacturer, each fuse was made with strong and durable materials in order to give satisfaction. View the full list of products below to find the one for you, and if you have any questions or issues concerning our items, please contact us at store@gekko-inc.com or chat with us live.